Dood! 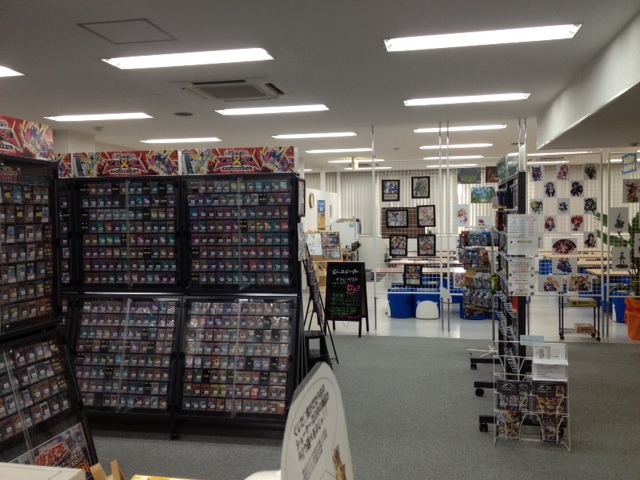 It’s a new card shop in Nagoya! If you’re a fan of the Disgaea strategy RPG on PS2, PS3, and PSP, then you no doubt know about what Prinnies are. If you don’t . . . . well . . . click here . They are a popular sub character from a somewhat ‘cult’ video game, and SOMEHOW, somebody decided it would be a good idea for the name of their card shop. I believe there are a few spread out over Japan, and this is the first one in Nagoya. It opened in May this year, but news of it hasn’t spread around the city yet. I only just found it 3 months later in August, and only because it just recently showed up in Wizard’s locator. I had a chance to check it out the other day before work and I was impressed. Let me take you on a tour. Being a new store, their stock isn’t as large at the other ones. They have a lot of Return to Ravnica block cards, rares and other rarities included, but they don’t have a lot of the older cards from before Innistrad. The staff said that once more players come to the store to sell their cards and when newer sets come out, this section will most likely expand. The prices were alright, but nothing to run home about. I’d say they are cheaper than that of Card Brunch (which is a few blocks down the street), but they are less competitive than Amenity Dream or Trading Card Game Shop 193. They also sell booster packs behind the counter, and the prices are what you would expect from most gaming shops. The most popular card game at the shop currently is Vanguard. They also have a large amount of Yughi-oh Cards, and Pokemon cards as well if you’re into those games. While the card selection and prices are nothing to write home about, I think you should really take note of the environment. First off, its a very large space with adequate table area to sit down and not be smashed up against other people. Also, being a new store the air is fresh and smells of wood. If you’ve been to Card Brunch before, then you know how had the B.O. (body odor) can get there. Eight tables with eight chairs means that it can handle up to 64 people events. While I don’t think they’ll be having Magic events that large, it’s still good to know. Prinny Club does a really good job of creating a comfortable atmosphere for their customers. On top of a large, clean playing space, they also offer a soft drink bar for a small price with unlimited refills. If you plan on spending the large part of a Saturday or Sunday there to play cards with friends, it might be a good idea to splurge for it. If you’re there playing a tournament, it becomes cheaper to get the drink bar in addition to the tournament entry fee. As for tournament fees, there are two prices, one for members (sign up for a one time 100 yen fee), and one for non members. I will go over the members fee, and for the non member’s price you can add 50 yen to it. Tournaments require a 350 yen fee to enter, but you can also purchase “free time” to use the table as long as you want for 400 yen. If you and your friends want to run a booster draft together, or play for fun, this is the best option for you. Their prize structure for tournaments is also a little different from other places. It could be their way of doing things, or just the case because they are a new store and don’t receive free prize support packages for their players, but Prinny Club offers points on members cards that can be used at ANY time towards anything in the store. This includes single cards, accessories such as sleeves, and booster packs as well. As you can see from the picture, the top 3 players from each event receive points. First place receives Y (the number of players in that event) x 70 points, 2nd place is Y x 30, and 3rd place is Y x 20. For example, if 10 people show up to Friday Night Magic or their weekly casual Saturday event, the winner will receive 700 points (or 700 yen) towards anything in the store. This is a great way to collect rare cards you are missing, and because their Saturday event starts every week at 5pm, you can probably do an earlier event in the day then go there to wind down. This isn’t the only thing points are good for though! Like I said before, they treat their customers very well here. At the end of every month rankings are posted and the person with the highest point totals from Prinny Club’s FNM and Saturday casual events gets a free Prinny drink tumbler and I believe a bonus 1000 points on their card as well (if that’s what it says on the right hand side of the poster). Even though this is a new store and you won’t be able to play in DCI sanctioned events and receive planeswalker points until they ‘level up’, the incentives to play such as the drink park, pleasant smell, generous point system to buy goods with, and monthly rankings make it worth your time to at least try and play there on Saturday evenings. Another reason to check it out is that it is very easy to get too. It’s probably one of the easiest stores to get to in all of Nagoya. Take the Meitetsu, JR Tokaido line or JR Chuo line to Kanayama station. Once exiting, take the exit on the JR side of the station (the Asunal shopping area is the side you want if this is confusing). Once you exit the station, turn right and walk down to intersection in front of the Pachinko parlor. You should see a McDonald’s and GEO rental store across the street. You’ll have to cross the street in front the Pachinko place then cross again to get to the side with McDonald’s. If you look up, you should see a group of signs with GEO, Animate, and Prinny Club. Go through the doors between GEO and the stairs, and you’ll be at the elevators. Take the elevator to the 3rd floor and you’re there. It’s as simple as that. This store has a lot of potential. If it levels up in the near future and can start holding DCI sanctioned events, I think it will get a lot more players. I personally would be happy to stay on my side of town on Saturdays instead of going all the way over to Nagoya station to play in an event. I look forward to playing there every Saturday evening at 5pm, and if you’re in the area you should stop by too dood! Do the Prinnies say “dood” in the Japanese version? Never played the Japanese version, but I’ll find out.